The Paste Up collection is inspired by urban paste up art. 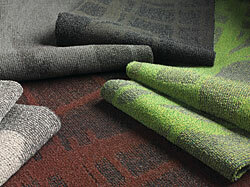 The six modular carpet designs use combinations of tip shear and textured loop constructions. Supplied in 50cm carpet tiles produced using 100 percent solution dyed nylon. Product is PVC-free and produced with alternative energy.